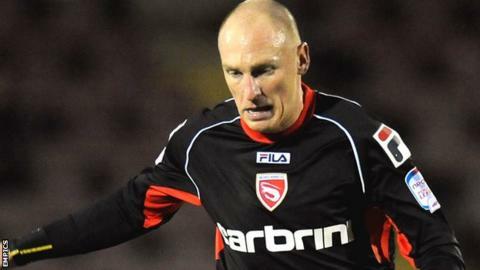 Winger Kevin Ellison has revealed that he ignored interest from other clubs before signing a new contract with League Two side Morecambe. "Younger lads might have gone but I enjoy it here and I'm happy to stay," he told BBC Radio Lancashire. "I'm effective and I know what I can do at this level, so I think I've still got a lot to offer." Ellison, who joined Morecambe from Bradford in 2011, has netted 12 goals for the club this season. And manager Jim Bentley was full of praise for the strike, adding: "Kevin's goal was certainly the best I've seen in a Morecambe shirt. "If it was in the Premier League, it would be all over Match of the Day. It was an unbelievable strike. I'm sure everyone will go away talking about that strike. It was that good." The Shrimps have won five of their last eight matches and have climbed to 10th in the table, eight points from the play-off positions with 10 games left to play.